ALM Octane contains the information to analyze development quality. 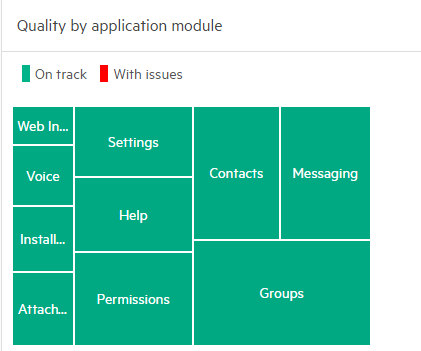 Track quality in the Backlog, Quality, Pipelines modules, or the Dashboard. Tip: Also, with OData support, you can generate sophisticated reports that directly access ALM Octane entities to help with your analysis. For details, see OData support for extended reporting. Associating tests and defects enables ALM Octane to provide better quality analysis. The Test Coverage widget summarizes the last unique native run statuses for each test. If you run a test with the same configuration as a previous test run, ALM Octane updates the new result. Hover over the widget to open the detailed run results or click View runs link to view a filtered list of the last runs. To see a specific epic or feature, select the node in the backlog tree. In the Dashboard, add a filter to display items relevant to your release. ALM Octane displays a risk icon for features associated with risky commits. You may want to increase testing on these features or postpone their release. 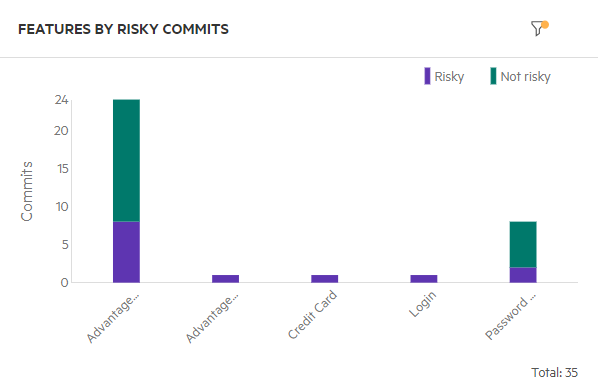 For more details, see Identify risky commits and features at risk. Note: Charts and graphs based on test runs display only the following summarized run statuses: Passed, Failed, Planned, Skipped, and Blocked. Each individual, native test run status falls into one of these categories. This is for clarity of analysis. When you first create tests, you usually create tests of a specific feature assigned to a release. For example, you have a feature to improve the shopping cart area of the application . In the Backlog release tree, there is a feature node for the shopping cart. The feature contains user stories. Each user story has acceptance tests. In doing this, you change from testing release quality to testing product quality. To analyze product quality, ensure that you associate features, user stories, defects, and tests with application modules. 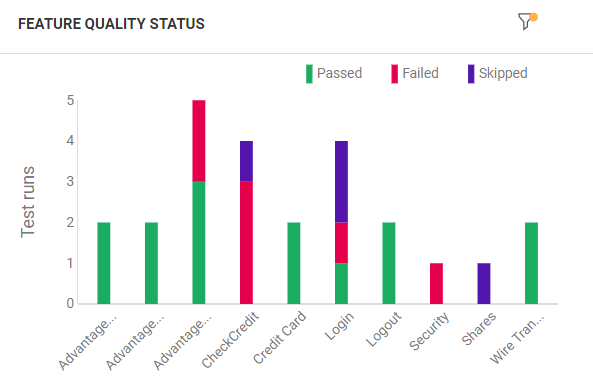 ALM Octane uses the test results and defect analysis to paint a picture of application health across releases. Using these measures, you gain a global picture of your application's quality at a specified point. The Last runs widget summarizes the last unique native run statuses for each test. If you run a test with the same configuration as a previous test run, ALM Octane updates the new result. To see application module, select the node in the application module tree. In the Dashboard, add a filter to display items relevant to your application modules. ALM Octane collects information about pipeline runs, build failures, automated test runs, and SCM commits. Link this information with your backlog and application modules to provide a comprehensive picture of the connection between your build quality, and your release and product progress and quality. Track and analyze pipelines in Dashboard widgets and in the Pipelines module. In the Dashboard, select widgets from the DevOps and Analytics section or create custom graphs based on pipeline information. Create a custom widget, and in Scope > Item type, select Pipeline runs, Test runs, Test run history (automated), or Commits. If you add tags to your pipeline runs, you can use a graph to view pipeline runs, divided according to your tags. Use the Pipeline runs by failure type widget to see how many of your pipeline runs are failing for each reason you listed. A custom graph based on the item type Test runs displays only the tests' last runs. To create a graph that includes automated test runs from the past, select the Item type: Test run history (automated). The graph displays the number of automated test runs per category. The Y Axis is set to Count and you configure in the category in the X Axis. For example, you can see the number of runs per pipeline, environment, or release. To view the list of test runs, click a column or category in the graph. Filter the graph by Pipeline run to see the automated test runs from specific pipeline runs. Caution: If you filter based on Latest pipeline run, you can filter by Pipeline as well, but do not filter by Pipeline Run. In the Pipelines module, you can find several layers of information. The Live Summary tab provides a high level live view of each pipeline's history, its current status, and its progress. In the Pipelines tab, you can see all the pipelines that are being tracked, and filter to see the ones that interest you. You can see summary information about each pipeline's last completed run, and more detailed information about the selected pipeline. You can open an individual pipeline or pipeline run to learn more about its status, its run history, related code changes, affected application modules, and more. You can also find analytic information about failed tests and tools to help you analyze failures. For details, see Run pipelines. You can check the quality of the application development. This enables you to see quality by comparing the total number of test runs and the status of each. This enables you to see the problems based on open defects. This enables you to recommend further regression testing before finishing the release. 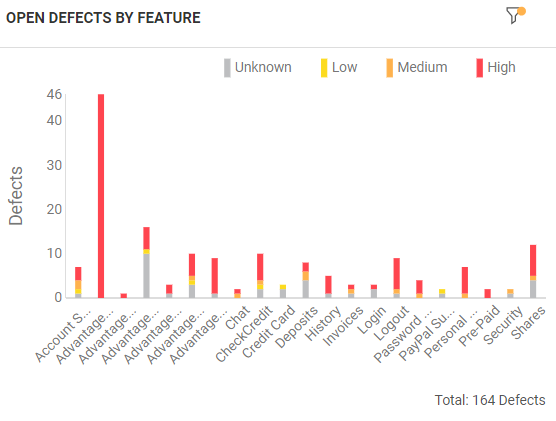 This graph enables you to see the quality of each area of the application. You can configure the Criteria to use to determine the level of quality. For example, you can use the number of defects, percentage of failed tests, or percentage of risky commits.